The first time my husband and I attended a convention in New Orleans, it was spring and something called the Jazz Festival was going on. The sights and sounds and flavors were almost overwhelming. To this day, certain food just takes me right back to that time and place. We had Eggs Benedict at Brennan's, doughnuts at the Cafe du Monde and ate our way through plates of spicey crawfish. I also remember a wonderful Asian, carry-out restaurant called, Takee-Outee. Their front display window featured a plate of the most beautiful tempura shrimp and I wanted some! When my order came, it did not look like the food in the window. After much gesturing, I finally got my message across to the non-English speaking server - I wanted my shrimp to look like those in the display window. The Asian gal laughed, pointed toward the window and said, "Dat Plastic!" I felt like an idiot, and quickly left with my real tempura shrimp. It was delicious. Some time later, we attended the actual fesival. While jazz is not my favorite music, I did enjoy the Jazz Festival. Actually what I loved was the food offered at the festival. Large tents were scattered all over the jazz fairground and I visited each and every one. I remember well my first taste of red beans and rice. It was love at first bite - I couldn't get enough of it. Back at home in the Midwest, I missed those bayou flavors. I could duplicate the Eggs Benedict and the rectangular doughnuts from the Cafe du Monde, but it took me years to produce a red beans and rice recipe to be as wonderful as those with real New Orleans flavor. (I added Avocado to my recipe because I love it - not a New Orleans thing). My original recipe used dried red beans, (see directions below), but I learned to skip that whole soaking/cooking step and buy canned beans. It shortens the cooking time and the taste is just as delicious. In a large pot, add ham and beans and the next five ingredients and the garlic. Barely cover with water. Bring to a boil and simmer uncovered for 2 hours. * Make sure beans do not stick or become dry. Add more water as needed. When meat is falling apart, add margarine and remaining seasonings. Cook another hour with the lid on, very low heat. Correct the seasonings by tasting. Mash some of the beans by pressing them against the side of the pot with the back of serving spoon. Mix well. Serve over hot rice. 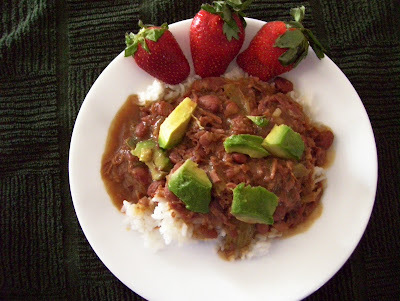 Note: I usually serve this dish over a fluffy, long grain rice, but I tried a sticky rice and it was so satisfying...it is my new favorite with the red beans mixture! My updated version of Red Beans and Rice features avocado, shredded cheddar cheese, sliced grape tomatoes and a side of pepperocini. Served over fragrant rice. Dried Red beans directions: use 1/2 lb. dried beans. Soak overnight in a lot of water. Drain water and place soaked beans in a heavy kettle. Add ham and the other column-one ingredients and the garlic. Add water to barely cover. Bring to a boil and turn down to simmer. Simmer uncovered for 2 hours. Follow directions above from *. (Old red beans will not soften unless cooked with a pressure cooker).